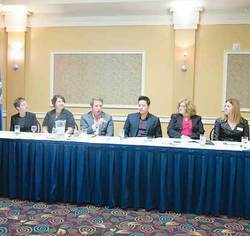 Five speakers from the Alberta Government were featured at the Leduc Chamber's 2013 Labour Strategies Breakfast held on Oct. 8th, and sponsored by the Leduc-Nisku EDA. Topics such as Aboriginal development, attracting national and international labour, and disability related employment were all up for discussion. Photo graciously submitted by the Leduc Regional Chamber of Commerce.